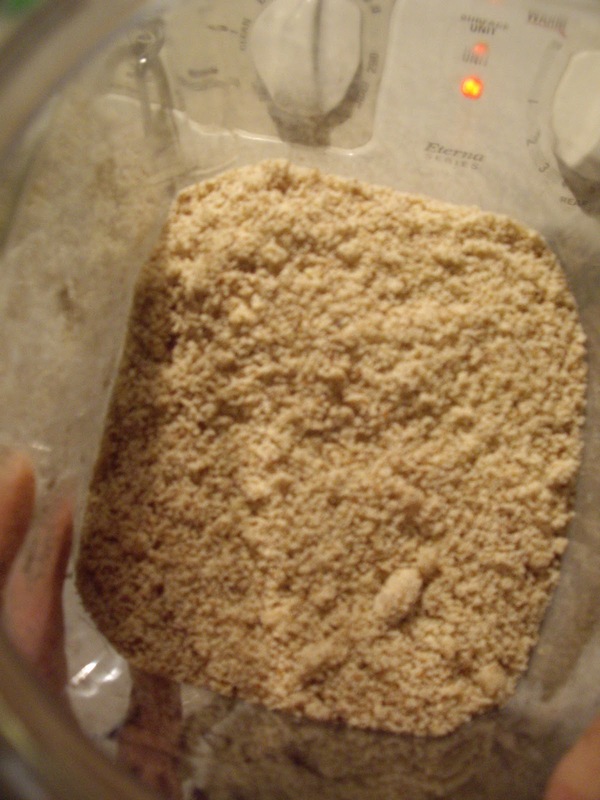 If you cook gluten free, almond flour is an ingredient that comes in handy. If you are not gluten free. it is still a great way to add fiber and nutrients to your diet. You can use it for baking and for breading. It can be quite expensive to buy at the store. However, it is very simple to make. This works great if you have a spice grinder. But, a food processor or a blender that can grind nuts will also work. You also need a fine mesh sieve(strainer) and bowl. Add a small handful of almonds to your spice grinder. Pulse off and on for a minute. Check and if it is mostly powdered, stop. Put the sieve over a bowl and dump in the ground almond. With clean hands or a spoon, press the flour through it into the bowl. You may have larger pieces of almond left. Put them back into the grinder and pulse until fine and again press through strainer. Repeat with more almonds until you have as much as you want. Be careful not to grind for too long or you will get almond butter. To keep fresh, store in the refrigerator. Many people are sensitive to gluten found in many foods. This is also known as celiac disease. It used to be that not eating gluten meant giving up so much. But now, there are so many different gluten free flours that you can eat baked goods that you may have thought you’d never have again. Gluten is a protein found in wheat, barely, and rye. Gluten helps with the rising in baked goods when a leavening and liquid is added. It also helps develop structure. If you are unable to have any gluten, you need to read all labels on food. The FDA states that if a certain gluten is removed from a product it can be labeled gluten free. So, it could still contain small amounts. When eating or cooking with anything that needs to be gluten free, make sure you look at all labels for certain things that could give you a clue there may be gluten in it. Oat flour can also be used as long as it was not processed on a machine that also processed wheat. You can find many recipes that a gluten free, but you can also just try adjusting your own recipes with a mix of different flours.